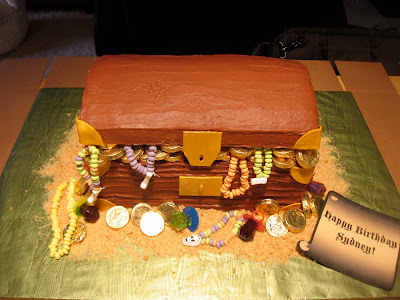 I've been wanting to do a treasure chest cake for a while now so I was REALLY happy when someone asked me to do this cake! It's a chocolate cake with chocolate buttercream. The lid was made with rice krispy treats and the cake was decorated with fondant and candy accents. There are four 1/4 sheet layers of chocolate cake for the base of this structure. There were also four layers of rice krispy treats that were carved to form the lid shape, that is sitting on a 1/4 sheet board. (thanks rodney!) There are several dowels through the cake that go through the lid and also serve as as a hinge for it to sit on, making it appear to be open! The entire thing was iced in chocolate buttercream. I made the wood-like effect using my small icing knife. I ran it over the length of each side, several times until I got the look that I wanted. I knew it didn't have to be perfect because the chest is supposed to look old! I placed several chocolate gold coins on top of the cake part before we attached the lid and added more in the empty spaces once we had the lid on and secure. 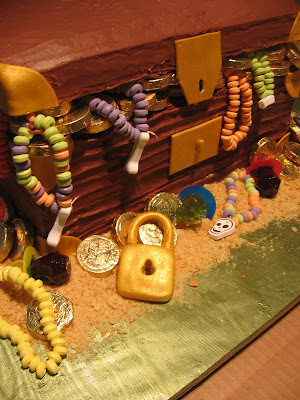 Once the cake was iced the way I wanted it, I added several different candy pieces (necklaces, bracelets). I then attached the mmf pieces I'd made earlier to the chest - the lock pieces, the corner pieces and the hinges. To make these, I used a small batch of marshmallow fondant that I colored a golden yellow color. I then painted the pieces with "old gold" luster dust. Crushed up vanilla wafers were added to look like sand and the remaining candy was added on just before the cake was delivered! I didn't have any problems with this cake. Everything went super smoothly and it's probably one of the cakes I'm most proud of! 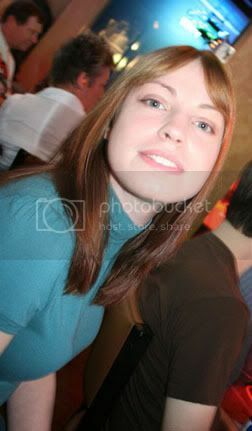 Happy birthday to Syndey! That is COMPLETELY awesome. I can't believe that's edible, it looks so real! 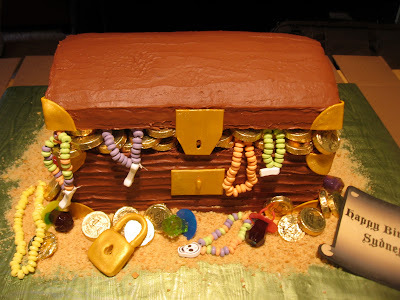 i was looking online for ideas to make a treasure chest cake for my niece and yours was the best I found!! I was hoping you could help me (would have ordered a cake from you but am based in los angeles, ca..bummer)...how do you attach the lid of the chest to the cake? you mentioned the use of dowels...but I dont quite get it...especially the back of the cake where the lid would meet the bottom layers. I really appreciate your help. Thank you. 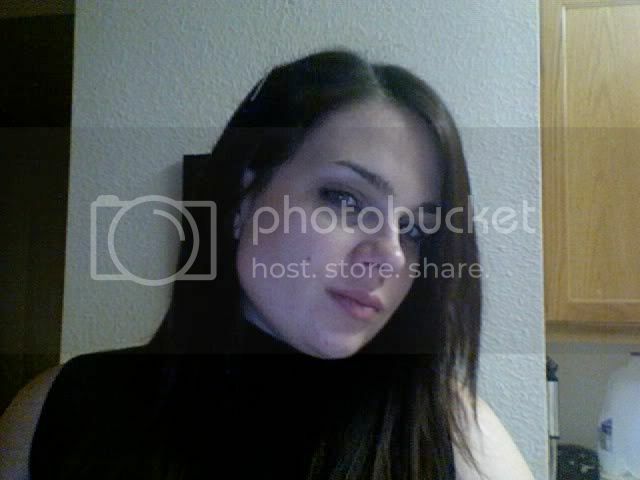 I just wanna rock and roll all night and party every day.